Do you want to obtain your US Green Card and live with your family anywhere in the United States? It’s possible with a $500,000 USD investment in the EB-5 Program. Rahbaran & Associates is one of the top 5 rated immigration law firms in the United States that specializes in the EB-5 investor visas from Mexico and other Central American countries. We have helped over 1,500 Mexicans and 5,000 investors worldwide obtain their US green card through the EB-5 program with 100% approval rate. The event sold out within 2 weeks last year and 14 out of the 100 attendees obtained their US Green Card through the EB-5 program. Act fast and register today. Reza Rahbaran, the founding partner of the Firm, specializes in the EB-5 program, and is an expert on licensing for OFAC, Reza culminated his studies In London, And In 2002 he was admitted to practice law in the New York State and later in Washington D.C. Reza is a member of the Bar’s education programs for lawyers, where he talks about EB-5 and many other immigration topics. All of EB-5inc. projects are specifically selected to generate a significant number of jobs, structuring our offers to provide the EB-5 investor guarantees and specific guarantees for their investment. We understand that this is an important decision for you and your family, so we will provide you with all the answers to your questions and necessary support so that your investment decision can be fully informed. 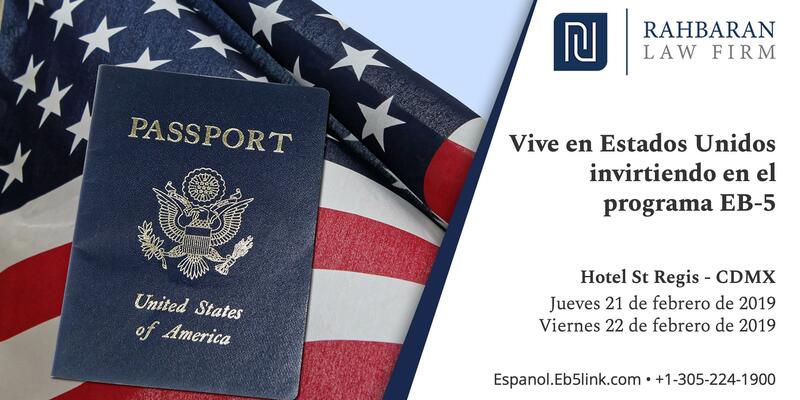 We look forward to helping you obtain your permanent US Residency for you and your family. Register for your timeslot today.